I miss the 80s: weird track bikes. Unlike a lot of steel track bikes you’ll see at NAHBS which are built to look cool, these track bikes were meant to be ridden and ridden fast. 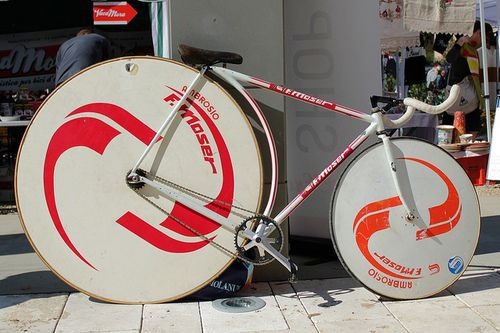 The first was a bike built for Francesco Moser in an attempt to better his Hour Record. The bike uses what appears to be a 650C front wheel as was common for pursuit bikes at the time, and on the rear is a big f**k-off wheel. The Yeti bike on the bottom was a kilo TT bike for American Rory O’Reilly, and uses 24” wheel front and back. About a six of these bikes were made for O’Reilly and four team pursuiters. Perhaps these bikes were evolutionary dead ends, but they sure were interesting. Moser’s bike looks like it has a 45-47tooth chainring or possibly smaller with maybe a 20t cog….I bet that gear is still hella steep. And then get a load of the Yeti’s gigantor chainring.